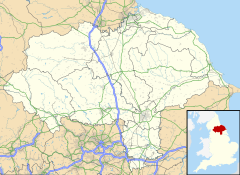 Linthorpe is an inner-suburb, and former village in the unitary authority of Middlesbrough, in the ceremonial county of North Yorkshire, in North East England. The original hamlet, or village, of Linthorpe, ran along either side of what now is known as Burlam Road (previously known as Acklam Road) next to Linthorpe Cemetery. In the late 19th century and early 20th century developers bought up much of the surrounding farmland and began to create a suburb of wide tree-lined avenues on which they built individual villas and terraced properties of some decoration and size. This was during a period of expansion for Middlesbrough. A tram service then connected this new desirable area of 'Linthorpe' to the centre of Middlesbrough, where the new residents usually held managerial, or directorship positions. At the bottom of Burlam Road (Acklam Road end) there are two original cottages still standing today 2011. A grammar school for girls was built with the benefaction of Alderman Kirby and the Carter Bequest Hospital was erected by a bequest from Alderman Carter. The Broomlands, was a home set up for socially deprived children and orphans. The Linthorpe Hotel public house, formerly a doctors surgery and residence, was opened in 1957 and stands within its own original expansive grounds. These grounds once contained a carriage turning circle, vegetable garden, orchard and lawns. The grounds still possess several mature trees around the perimeter. On Roman Road, Linthorpe is The Northern School of Art. There is a fairly new community centre situated in Linthorpe which holds popular classes and events on a regular basis, distributing newsletters to the local community. One of the more recent buildings in the area is the Carter Bequest Hospital. It was originally intended for the benefit of less fortunate people. It has since been used as a private hospital and is now a local hospice. Deriving from 'Leofa's village', the present name of Linthorpe has also been recorded as Levynthrop, Levingthorp and Linthrop. The original site was near the junction of the present Acklam Road and Burlam Road. The present Linthorpe Cemetery was then the village green. 'Levingthorp' also included the hamlets of Ayresome and Newport. The main farm in the area was Arnold Toft House which is said to have stood on the site of the present-day Little Theatre. This modern building was only erected in the 1950s and opened by Sir John Gielgud in 1957. The company of the Little Theatre itself was formed in 1930 but their productions then took place in St John's church hall on Marton Road. Linthorpe was once known as Linthorpe Lane, being a main route from the original settlement of Middlesbrough. Roman Road was probably an original Roman route as can be seen on the map of Roman Cleveland. The Blue Hall was a building situated on the corner of Roman Road and Burlam Road. It was reputedly used by smugglers from Newport. Inevitably a rumour exists that there was a subterranean passage from here to the manor house at Acklam; there is, however, no evidence to sustain this. The Blue Hall, demolished in 1870, could have been in existence as far back as 1618. Some of the white cottages of Old Linthorpe survived in St Barnabas Road until they were demolished in 1935. The Victorians were responsible for building the present Linthorpe village which they referred to as New Linthorpe. Albert Park was opened in 1868 by Prince Arthur, Duke of Connaught and Strathearn. It was created in the rural area of Linthorpe and presented by Henry Bolckow, one of Middlesbrough's ironmasters, at a personal cost of £3,000. In 1872 West Lane Hospital was erected on land taken from Linthorpe Cemetery. It was to be a fever hospital. Also in 1872 the first church services to be held in Linthorpe were in Olive's Gym adjoining the Park Hotel. The following year they were held in the Linthorpe cemetery church. The foundation stones for the first 'proper' church were laid in September 1891. It was in 1897 that this Linthorpe parish church of St Barnabas was opened 'free of debt'. Linthorpe Schools were originally opened as the Wesley Day School on 9 January 1871. On that first day the log: book reads '14 scholars were admitted'. The first week's fees amounted to three shillings. The number of children gradually increased over the following months. Although absences were common the reasons were investigated and usually logged as being 'satisfactory'. Today the schools are housed in two separate buildings – infant and junior – on the site in Roman Road. The local Middlesbrough Football Club was formed on 18 February 1876 in the Talbot Hotel. The first recorded game was a draw against Teesside Wanderers in 1877. The matches were then played on the Archery Ground in Albert Park. In 1888 the Football League was formed but the following year the team split into Middlesbrough and Middlesbrough Ironopolis, and introduced professional football. They tried to amalgamate in 1891 but could not agree on a name or a ground Ironopolis became financially unsound and folded in 1893. Middlesbrough kept its amateur status and continued by winning the Northern League. The club moved to Ayresome Park in 1903. Tim Williamson made his debut at Middlesbrough in 1902 and went on to become Boro's first England International player. Today people of the area refer to Linthorpe as 'The Village' although it is mainly the shopping area at the southern end of Linthorpe Road to which they refer. The community of Linthorpe extends between the areas of Ayresome, Acklam, Tollesby and Middlesbrough town itself. It is very much alive and varied in its population. Another notable aspect of Linthorpe's past can be found in its pottery. In 1879, out of the old Sun Brick Works, which had been owned by John Harrison, sprung a new enterprise that brought to local pottery artists an international recognition. The conversion proceeded under the guidance of Dr. Christopher Dresser, an orientalist, architect, and designer, who visited Middlesbrough while on a lecture tour. His underlying idea was to bring work to idle hands created by the failing iron trade. The local clay, though common, was thought to be suitable for the manufacture of high quality products through innovative use of gas-fired pottery kilns. The new pottery firm came into being in August 1879 as a partnership between Dr. Dresser and John Harrison, a local landowner and entrepreneur; it ran until 1889. In 1881-1882, the £50,000 share certificate was issued to bankroll the proposed Linthorpe Pottery Works Company, however, for some reasons this planned expansion did not go through. Linthorpe Art Pottery was noted for the boldness of colour and high glaze and it was exhibited at the Society of Arts Exhibition of Modern English Pottery in 1882. It became known worldwide at the International Inventions Exhibition of 1885 in London at the Alexandra Palace where it was awarded a gold medal. It was there that Princess Alexandra of Wales acquired the Linthorpe's turquoise vase. The Linthorpe Pottery secured more prizes at the World’s Industrial and Cotton Centennial Exposition in New Orleans in 1884-1885. Orders began to pour in from all over the world. Despite national and international recognition, the success of Linthorpe Pottery as a business venture was short-lived as Harrison ran into financial troubles after the failure of Onward Building Society and had to declare bankruptcy; production at the Linthorpe Pottery ceased in 1889. It was sold by auction in April 1891. In 1897 the site of the pottery was proposed as a zoological garden – in a manner of Belle Vue Gardens. This promised a dance room, side shows, sensations and novelties, fireworks and a permanent zoological collection with hundreds of strange animals and birds – all for sixpence. Some 20,000 people attended the opening but found it to be some sort of hoax. There were hardly any attractions, just a few meagre cages of monkeys and birds on show. It lasted seven days and, apparently, for weeks afterwards the bodies of the animals were seen floating on the Pottery Pond. [citation needed] Belle Vue Road is said to be named after the ill-fated zoo and is the only reminder of this fanciful project. More recently the site of the pottery was used as a laundry facility. The largest collection of the Linthorpe Art Pottery ware in the world was assembled at the local Dorman Memorial Museum. Marion Coates Hansen, women's suffrage campaigner, lived in Linthorpe prior to 1911. ^ UK Census (2011). "Local Area Report – Linthorpe Ward (as of 2011) (1237321149)". Nomis. Office for National Statistics. Retrieved 11 February 2019. ^ Historic England. "ALBERT PARK (1000646)". National Heritage List for England. Retrieved 25 February 2016. ^ A novelty in Art Pottery, 15 November 1879. ^ Jonathan R.A. Le Vine. Linthorpe Pottery, Teesside Museums and Art Galleries Service, January 1970, Revised 2007. ^ Bracegirdle, C. Linthorpe: The Forgotten Pottery, Country Life, 29 April 1971. ^ "Linthorpe Art Pottery". Dorman Museum – Galleries Linthorpe Pottery. Archived from the original on 30 October 2009. ^ a b Herring, Richard. "Episode 64 – Bob Mortimer". Richard Herring's Leicester Square Theatre Podcast. comedy.co.uk. Retrieved 17 June 2015. ^ Pollard, A.J., ed. (1996). Middlesbrough: Town and Commubity 1830–1950. Thrupp, Oxfordshire: Sutton Publications. pp. 118–19. ISBN 0-750-91270-7. J. Rudoe. Decorative Arts, 1850-1950. A catalogue of the British Museum collection. 2nd ed. 1994, no. 96. The Cleveland Village Book, written by members of the Cleveland Federation of Women's Institutes and published by Countryside Books.